Tan Chia Ee clinches the Highest Achiever Award from the South Australian Certificate of Education (SACE) Board. 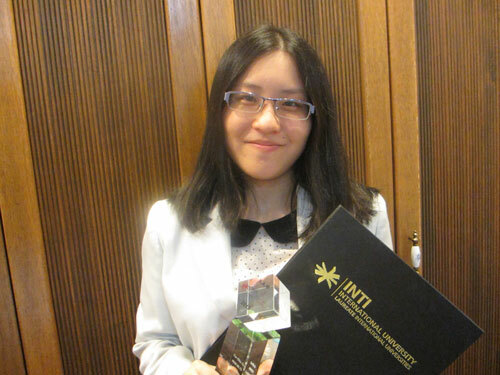 An ATAR (Australian Tertiary Admission Rank) of 99.75 placed Tan Chia Ee, an INTI International University students who sat for the South Australian Matriculation (SAM) 2013 exam, among the top 1% of the world’s achievers and a step closer to her aspiration to become a neurosurgeon. Tan Chia Ee with her awards. Chia Ee has been awarded the SAM Highest Achiever Award, an honor given to SAM students with the highest ATAR in Malaysia and China. She also received the SAM Subject Highest Achiever Award for Biology, and the SACE (South Australian Certificate of Education) Merit Certificate for Biology and ESL Studies. An elated Chia Ee said she drew inspiration from her seniors in the Class of 2012, Lew Yun Xin, Chiew Chong Keat and Kenny Liew. “When I saw them receiving awards for achieving ATAR of above 99, I resolved in my heart to emulate them,” she said. “Chia Ee actually outdid her seniors. The top student of 2012 scored an ATAR of 99.56. These results are evidence of INTI’s staff and students’ commitment to a tradition of ever-improving academic excellence,” said Mary Ng, Director of Pre-University Studies at INTI. At INTI International University, 35.09% of the 2013 SAM exam candidates achieved an ATAR of 90 and above to be ranked among the top 10% in the world. Among the high achievers were Loh Wen Kai and Sam Ong who received the Highest SAM Subject Achiever Award for Mathematical Studies and Research Project respectively. SACE Merit Certificates were also presented to Sarah Goh and Tan Sue Faye for ESL Studies, Sam Ong for Research Project, and Loh Wen Kai for Mathematical Studies. The internationally recognised South Australian Matriculation qualification is equivalent to Year 12 of education in Australia. It allows students to gain direct entry into universities in Australia, New Zealand, the UK, USA and other countries. Assessment of individual subjects in the South Australian Matriculation programme consists of school assessment (70%) and external examinations (30%). The school assessment component encourages independent learning and hones study skills for university. Assessment tasks including projects, assignments and laboratory work are assigned yearlong; and marks are submitted to the SACE Board to be moderated during the external examinations. External examinations are provided by the SACE Board of South Australia, a statutory authority of the Government of South Australia, and developed by examination panels that include secondary school and university representatives. The examination papers are marked in Australia, maintaining the high standards. INTI International University – the largest centre for SAM in the southern region of Malaysia – is one of the few SAM examination centres in the country that are recognised by the SACE Board, which awards the South Australian Certificate of Education and administers the SAM programme. INTI’s SAM graduates have gone on to complete their university education around the world, establishing successful careers in fields such as commerce, medicine, pharmacy, engineering and law. For further information on INTI International University’s SAM programme, call 06-7982000.